FontViewOK is a tiny Windows utility that makes it easy for you to preview all the fonts installed on your computer so that you will get an overview of all fonts available for use on your PC. 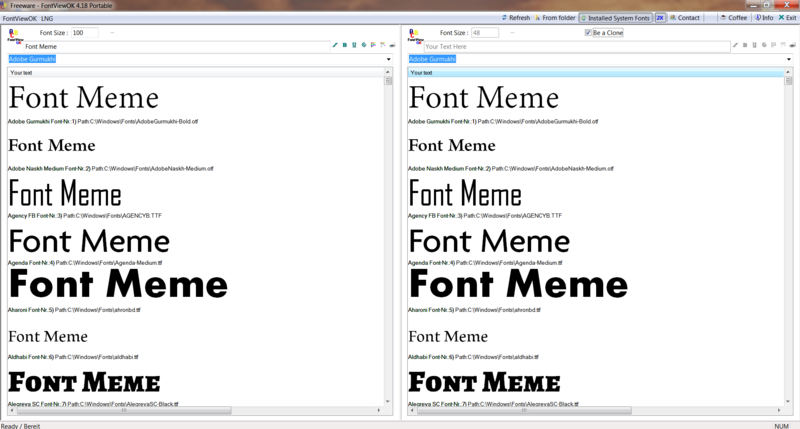 Why do you need a font viewer if you can preview all the fonts using the font selection menu in applications like Word, Photoshop etc.? Compared to those applications, FontViewOK is lightweight, fast and it lets you preview with your custom text and other settings easily. The utility has a very plain interface, consisting mostly of just a list of fonts. You can enter custom text and colors to preview the fonts, and can also see what the fonts look like bolded, italicized, struck-through, and underlined, as well as in different sizes and background colors. To compare fonts, you can split the screen and display side-by-side lists, making it easy to analyze the differences between fonts or find fonts that go well together. It also comes with a handy “Print” button to allow you to print the font lists. By default, it will load all you installed fonts on your system, but you can also choose to load fonts within a specified folder. The software supports almost all Windows versions and you can download it for free here.